This study focuses on the integration of faith and teaching. 12 university professors describe and reflect on their efforts to allow historic Christian practices to reshape and redirect their pedagogical strategies, reconceivign classrooms and laboratories as vital arenas for faith and spiritual growth. 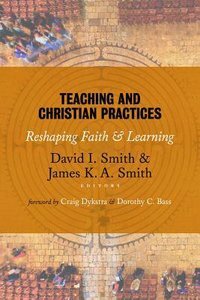 About "Teaching and Christian Practices"
James K. A. Smith (Ph.D., University of Villanova) is associate professor of philosophy at Calvin College in Grand Rapids, Michigan. Previously he taught at Loyola Marymount University in Los Angeles, California. He is editor of In the Twilight of Western Thought in the Collected Works of Herman Dooyeweerd, and he has written numerous articles on philosophy and religion, and has a remarkable grasp of Post-modern hermeneutics and interpretation. This is reflected in his publications Who's Afraid of Postmodernism? : Taking Derrida, Lyotard, and Foucault to Church (Church and Postmodern Culture Series: Baker Academic, 2006); Jacques Derrida: Live Theory (Continuum, 2005), Introducing Radical Orthodoxy: Mapping a Post-Secular Theology (Baker Academic Press, 2004). Speech and Theology: Language and the Logic of Incarnation (Radical Orthodoxy Series: Routledge, 2002); Letters to a Young Calvinist: An Invitation to the Reformed Tradition (Bakerbooks, 2010) and The Fall of Interpretation: Philosophical Foundations for a Creational Hermeneutic (InterVarsity Press, 2000). He is preparing four volumes The Violence of Finitude: Derrida and the Logic of Determination; Desiring the Kingdom: Worship, Learning and the Formation of Radical Disciples; The Devil Reads Derrida - and Other Essays on the University, the Church, Politics, and the Arts and Thinking in Tongues: Elements of a Pentecostal Worldview (Pentecostal Manifestos Series; Eerdmans, 2008).